This time, we will tell you about the restaurant business of one most famous chefs in the world, Gordon Ramsay. To be precise, about the restaurants that are owned by him in New York City and some important and interesting information about Gordon as well. This is an important thing for everyone who is into cooking or just likes a really good food. Born in Scotland, Gordon Ramsay was brought up in Stratford-upon-Avon, England, from the age of 5. With an injury that put an end to any hopes of a promising career in football, he went back to college to complete a course in hotel management. His dedication and natural talent led him to train with some of the world’s leading chefs, such as Albert Roux and Marco Pierre White in London, and Guy Savoy and Joël Robuchon in France. 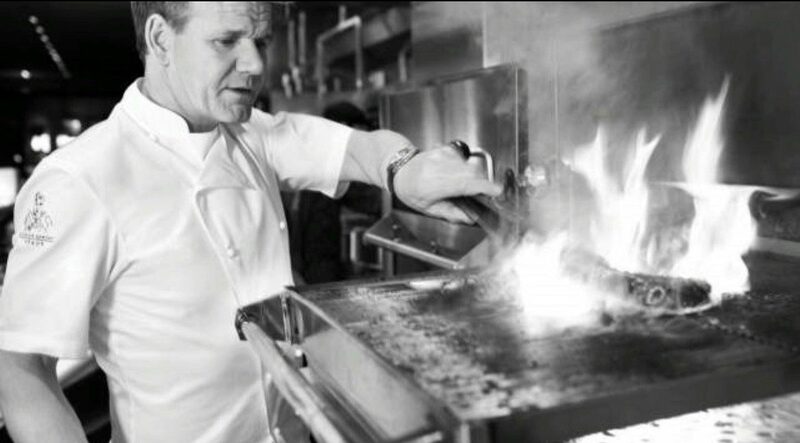 Now internationally renowned, Gordon has opened a huge number of successful restaurants over the world, from the UK to Italy to the United States and holds 7 Michelin stars. The Group continues to grow with two ventures in Doha, Qatar opened in 2012; a total of three restaurants in Las Vegas Gordon Ramsay Steak at Paris, GR Pub and Grill at Caesars Palace and GR BurGR at Planet Hollywood, also in 2012 and most recently in London Union Street Café in London’s Borough market (2013) and London House in Battersea (2014). Gordon has also become a star of the small screen both in the UK and internationally, with UK shows such as “Gordon Behind Bars”, “Ultimate Cookery Course”, “Gordon’s Great Escapes” and “Gordon Ramsay: Shark Bait”, as well as four top-rated FOX shows that air in more than 200 countries worldwide: “Kitchen Nightmares”, “Hell’s Kitchen”, “Masterchef US” and “Hotel Hell”. He is also a published author of a number of books, many of which have become bestsellers around the world, most notably his autobiography, “Roasting in Hell’s Kitchen”. Gordon has a global partnership with such well-known companies as WWRD (Waterford, Wedgwood, Royal Doulton), which offers quality home and lifestyle products. He lives with his wife, Tana and four children, along with their bulldog Rumpole and two cats. His workplace is based between Los Angeles and South London. Gordon Ramsay made his New York debut in 2006 with the opening of two restaurants at the revamped London Hotel, formerly the Rhiga Royal. After less than enthusiastic reviews for both, Ramsay merged the more casual of the two, the London Bar, with a clone of his hometown Michelin-starred Maze. “Gordon Ramsay at The London” was opened in 2006. The restaurant was awarded two Michelin stars in 2007 and was devoid of these stars in 2013. The expensive New York hotel restaurant, which was never fully embraced by local critics like Frank Bruni or Alan Richman, provided its last dinner service on 11th of October, 2014. “We’re closing fully to reflect the more casual dining style preferred by the guests. They really are demanding more of a casual dining scene,” a spokesperson for The London NYC, Amanda Duff, said to the media. Modeled after Gordon Ramsay’s London counterpart, “Maze” presents dishes of the contemporary French and wield a little Asian flair. There are regular change-ups to both the small plate à la carte menu and the chef’s menu (five courses for $70). For this kind of quality cooking, the lunch menu seems a bargain, particularly for New York ($24.07 for a three-course special menu; prix-fixe two courses $26 and three courses $35). À la carte lunch dishes may include carpaccio of tuna and swordfish or cider-glazed pork belly. Dinnertime might bring pan-roasted skate wing with preserved lemons or roast duck breast, baby golden beets and sesame purple kale. Desserts, like espresso mousse with chicory ice cream, leave a luscious mark. If you want to try a food of the highest quality and of the professional preparing do not miss this place.